Buck Dice is a dice game that is simple, quick, and rather addictive. It is an elimination game – the last player left is the loser. It is often used as a bar game among a group of players, to determine who buys the next round. The game begins with each player rolling a single die. The player with the highest number goes first, next-highest goes second, and so on. The player who rolls the lowest number rolls again to determine the "point" for the game. The game then proceeds with each player, in turn, rolling three three dice, and continuing to roll as long as each roll produces at least one point. One point for each dice that matches the player's point. Fifteen points if the player rolls a three-of-a-kind of the point value. This is known as a "Big Buck". Five points if the player rolls a three-of-a-kind of any non-point value. This is known as a "Little Buck". As soon as a player makes a roll that scores no points, the turn passes to the next player (making sure to keep a running total of the score for the each player). As soon as a player reaches 15 points or more, they are eliminated (they win!). The last player to not reach 15 points loses the game! To make the game last a bit longer, some people play with a rule that says if you have a score of "13" you only roll two dice, and with a score of "14" you only roll a single die. To make the game a bit harder, make "15" an exact goal. 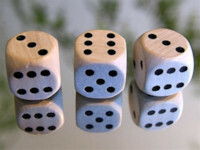 If a roll puts a player over 15, then the roll does not count, and the player gets to roll again. In this variation, a Big Buck is a winner no matter what (even if the player had previously scored points. Games can be "strung together" (making each a round), with the winner determined by the point total after a particular number of rounds (5, perhaps), and continuing in the case of a tie.